Home > Folkmanis Puppets > Finger Puppets > Red Legged Frog Finger Puppet by Folkmanis Disc. The Folkmanis Red Legged Frog Finger Puppet is 5 inches (12.7 cm) long with pinkish tone to its body. The frog finger puppet has dark, raised spots on its upper body to give it a realistic feel. 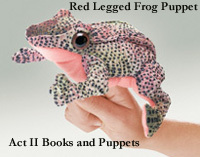 The Red Legged Frog finger puppets were released in January 2006 and discontinued in June 2011.